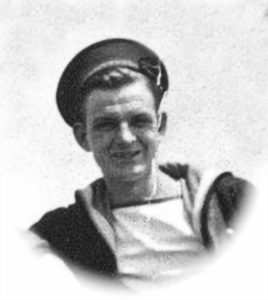 In 1944, I was an Able Seaman Gunner serving in HMS Swift, commanded by Captain J. Gower, R N. After experiencing some very hard times serving with the Russian Convoys, and the boredom of Scapa Flow, we were suddenly ordered in April 1944 to the Clyde. As we proceeded towards the Clyde we encountered a contact of an enemy U-Boat so we set off several patterns of depth charges, and finally it was destroyed on 17 April and all of the crew of U986 were lost. Once on the Clyde we did a considerable amount of bombardment training off the coast of Jura. As an A/B Gunner on Y Gun of our ship I, along with the rest of our crew, could not understand why – what did we need land bombardment training for? Then at the end of May we once again found ourselves sailing, but instead of north, this time we were sailing south. Expectations amongst the crew of HMS Swift, an S-Class Destroyer of the 23rd Flotilla, were that we were going to Devonport for a boiler clean and at last some leave. The speed that we were sailing at was a bit concerning, because we were going so slowly that it seemed as if we were just drifting. But a first light of the next day we discovered we had been joined overnight by the battleship HMS Rodney, and a host of corvettes and many destroyers. All through that day, more and more ships joined us, including HMS Roberts, HMS Warspite and HMS Ramillies. On the following day more capital ships, and many more sloops, frigates, corvettes, destroyers, and even trawlers, had joined our convoy. It was a sight beyond belief, and we knew by now that we were not going for a boiler clean. Slowly we all sailed on, and every day the convoy became much larger, and as we rounded the Lizard and into the Channel we were then joined by many assault ships and landing craft and it was only then that we discovered a small number of American battleships had also joined the convoy. Our Captain assembled the ship’s company onto the upper deck. Then we were told that our mission was the Second Front, the invasion of Normandy, which was to take place on the 5 June. The weather was turning very nasty, and on the 5 June the seas were running rough and wild. Once again our Captain spoke to us to tell us that the invasion was now postponed until the weather conditions were more favourable. The whole convoy bearing the spearhead of the invasion converged on the rendezvous south of the Isle of Wight, codenamed ‘Piccadilly Circus’, and there we sailed around in circles. Then just around midday on the 5 June we formed up into our convoy positions, the ships shuffling between each other to gain their correct positions. The seas were still very rough and there was a heavy mist everywhere. Nevertheless, this endless stream of ships set off, led by minesweepers on a wide front and heavily protected on all sides by the might of the navy and air force. The greatest armada of 7,000 ships and craft, 79% British and Canadian, 16½% American and 4½% other Allies, that had ever left our shores was now slowly making its way inexorably to the coast of France. HMS Swift, along with Norwegian destroyer Svenner, and HMS Scourge, were the leading destroyers just behind the minesweepers. Constantly mines cut free by the minesweepers that had not been dealt with, floated dangerously close to our ship, and on several occasions they almost touched our ship’s side. The entire ship’s company knew only too well that to make contact with just one of those deadly horns meant the end of our ship. All through that night we could hear the throb of heavy bombers overhead, and the crunching of the explosions they were delivering. There was a wind force of 5 and the seas were still very choppy as we made our way across the Channel. Then shortly before 0100am we saw the parachutes and gliders of the British airborne troops descending upon Normandy. By 0300am we were right within the Normandy area, where the minesweepers veered off and sailed north, leaving us to take up our positions. Ships great and small began the task of filing into their prearranged positions for the assault, a scene that might almost have come from a Spithead Review. The bombing and the jamming of the German Radar had already made it inoperable, and the immediate opposition from the enemy was limited to an attack by two German torpedo boats coming from Le Havre. On seeing this vast armada, they fired their torpedoes, then immediately fled back up the River Orne. These torpedoes missed our ship by only a few yards but hit our sister ship the Norwegian destroyer Svenner. She broke in half and sank almost immediately. As we had arrived at our designated position off SWORD beach at Ouistreham ten minutes early, our Captain decided to ignore orders and went to pick up the survivors. In that precious ten minutes we managed to haul aboard well over 100 survivors. We then proceeded inshore, and at 0500am the warships’ guns opened up along the whole of the fifty-mile length of the assault area of beaches SWORD, JUNO, GOLD, OMAHA and UTAH. Never had such a rain of shells and bombs poured on land targets from sea and air before. Even when the naval bombardment had begun the reply from the coastal batteries was desultory and ineffective, and it seemed there was no doubt that we had achieved a great tactical surprise. Destroyers and gun and rocket batteries mounted on special landing craft pounded the beach defences, whilst further out to seaward the mass of our capital ships pounded further inland. Just as dawn broke the invasion coast was lit up by flares and flashes as the naval guns pounded the German defences, and explosions of every hue rippled up and down the shoreline as hundreds of launches, small craft and landing craft scuttled amid the silhouettes of this great armada in preparation for their landing. At about 0730am the first of the landing craft put ashore in the SWORD beach area, and as far as I could see, although there was a great deal of fire power from the enemy, our boys seemed to have the upper hand. By 1030am we were firing at targets selected to be knocked out by the spotters who were now well inshore, and were able to see how our shells were landing, and if it was needed correct our range. It had been a busy day for us, but it must have been hellish for the survivors crammed below decks, many of whom were wounded. Later they were transferred onto another ship to be taken back to England for treatment. Every night the destroyers would have to relinquish their participation in bombarding the enemy positions, to form a defence to the outer perimeter of the invasion fleet, to fend off the stream of U-boats and E-boats coming from the French ports. Nightly battles took place fighting in the dark, frequently at point blank range, but the ships of the Royal Navy defeated the Nazi destroyers and E-boats attempting to break into the invasion area, and not a single enemy ship pierced our lines. These nightly sea battles, which ranged over an area of 300 square miles, involved more than fifty British warships consisting of Fleet destroyers, Hunt class destroyers, frigates, corvettes, trawlers, and light coastal forces. Several times the Germans were forced to change their tactics. They tried sending E- boats in packs; they tried sending destroyers; they tried slipping E-boats in pairs; they mixed destroyers and E-boats with combined air and sea attacks. Invariably they came up against a wall of fire, and often our ships were firing simultaneously at air and surface targets. Once in a forty-five minute spell of action, at speeds of thirty knots and more, the enemy ships were shuttled between our forces until they were driven off with most of their craft damaged. But night after night these fights went on. It was very much like a fast game of football trying to anticipate what they would do next, and having someone in the right spot to tackle them. ‘They never got as far as our full backs.’ It was estimated that a total of something like sixty E-boats were damaged, as well as several destroyers, and a number of U-boats were sunk. Among the ships taking part in these battles were destroyers HMS Kempenfeldt, HMS Ursa, HMS Stevenstone, HMS Swift, HMS Serapis, HMS Middleton, HMS Veralum, and HMS Jervis. During the day we would return from these nightly battles to take up our positions again along the beachheads, and resume our selective bombardment of the enemy defences. One such target was a huge gun that was situated on high ground between Caen and Le Havre. We plastered this with shells day after day, but it always seemed to survive our onslaught. Then from a spotter’s aircraft it was found that this gun after firing would roll back into a cavern cut in the hillside, and we would have to wait for it to fire then time its next firing time in order for us to hit it. This action took several days but it was finally destroyed, and our nightly battles in the Channel with the enemy continued. On the night of the 23 June 1944 as usual we had been into battle with enemy E-boats throughout the night, and at dawn we were returning to take up our position to continue bombarding the enemy defences. Our Captain had relaxed action stations so that we could get some rest. I went below to my mess deck, grabbed a cup of tea and then sprawled out on one of the benches. Needless to say I must have dozed off, when suddenly there was a huge explosion, followed by several more. The ship heaved, twisted and turned, ending up at a sloping angle where you had to catch hold of the fixed tables to keep yourself upright. Water was rushing in from everywhere. Sailors were clambering to get out through the hatch, and almost fighting each other to do so. I was furthermost away from the hatch, and the water was now up to my waist. There and then I realized that by the time I could get to the hatch it would be too late. Where I was standing at the time, immediately behind me was a very small hatch leading into the tiller flat. So I opened it and prayed that the hatch leading to the upper deck was not secured down. Scrambling through into the tiller flat, I found that luck was with me as the upper deck hatch opened. Once I had opened the hatch I called to all those who remained inside the mess deck that there was a way out but how many made it I do not know. When I arrived on the upper deck I saw that the ship had broken in half and the funnel was just disappearing; I released several Carley floats and then jumped over the side. I swam as fast as I could and got aboard a Carley float. I looked at my ship as it disappeared below the surface, and heard men crying for help but to no avail. I thought to myself how lucky I must be.